DESIGNER’S DREAM CYCLE USES A 4-HP. ENGINE AND GETS 60 M.P.H. IT SPORTS A POLISHED ALUMINUM BODY ON A LIGHT TUBULAR FRAME. WITH an eye to the short-trip driver, quick-delivery services, and vacationists, Ray Russell, of Detroit, has designed and built an unconventional motor scooter. His engineering model has been clocked at 60 m.p.h., he says, and gets nearly 60 miles to a gallon of gasoline. Wheels, motor, and driving mechanism are completely enclosed in a tubular-steel frame that gives protection in case of a spill. All are covered by a light-gauge aluminum body that can be lifted off in 10 minutes for servicing and repairs. When the scooter reaches production, the frame may be tough aluminum alloy. The model shown in the accompanying photos has a 4-hp. engine under the seat connected by a flexible coupling to two oil pumps. A lever controls oil flow through a valve to one or both pumps to provide three speeds. On the rear wheel is a hydraulic motor. The tubing of the frame serves as an oil reservoir, and a 2-gal. gas tank behind the seat contains fuel for 100 miles. Another model is planned with a chain drive and centrifugal clutch. Operation of either chain or hydraulic drive requires no gear shift. Starting is done simply by opening the throttle and stopping by closing the throttle and applying the brakes. The two airplane-type wheels are extremely light magnesium die castings. They use four-ply tires 18″ in diameter that absorb most of the road shock. 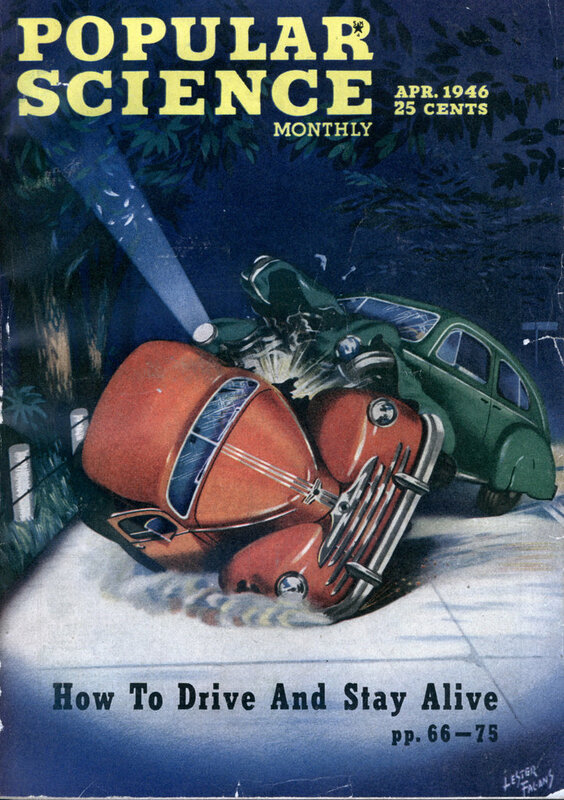 Russell believes that tires of this type may eliminate the need for springs. An engine-driven generator provides current for the horn, the single sealed-beam headlight, and the taillight. The instrument panel includes a speedometer. A windshield of clear plastic may be attached to the motorcycle handlebars by means of an aluminum frame. With the motor mounted under the seat, plenty of leg room is provided under the aluminum hood. The rear deck has space for a luggage compartment or goods to be delivered, or it opens up to carry a passenger who will ride on a foam-rubber seat cushion like that in the driver’s seat. No paint finish is planned, for the highly polished aluminum body itself adds to the appearance of the cycle. I just can’t see Hepburn and Peck tooling around Rome on one of these things. 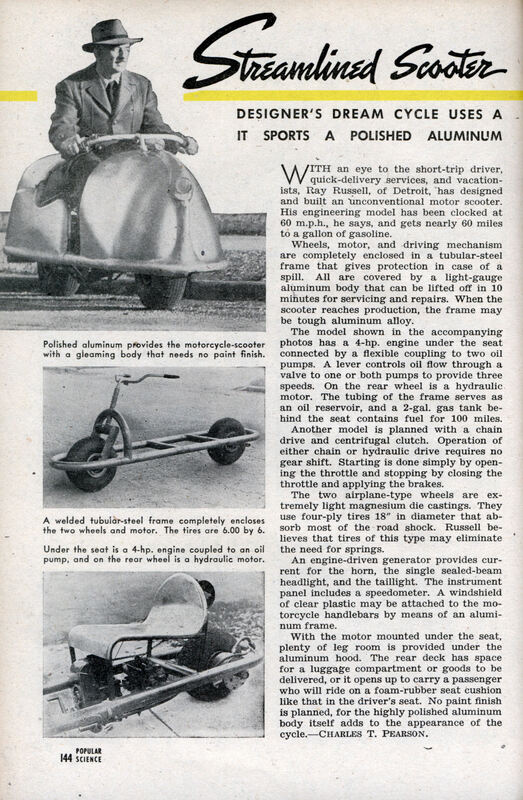 “Another model is planned with a chain drive and centrifugal clutch.” With a lawn mower engine, this was the common go-kart or minibike of the sixties. At first, I thought this was describing a motor scooter with a gas-turbine engine. It looks like the engine’s conventional, though – “Turbine Drive” is what is often called “hydrostatic transmission” these days. Many tractors use it.